In Bernard S. Raskas, Living Thoughts: Inspiration, Insight, and Wisdom from Sources Throughout the Ages (1976), 175. An individual can’t be judged by his group mean. Could Hamlet have been written by a committee, or the “Mona Lisa” painted by a club? Could the New Testament have been composed as a conference report? Creative ideas do not spring from groups. They spring from individuals. The divine spark leaps from the finger of God to the finger of Adam, whether it takes ultimate shape in a law of physics or a law of the land, a poem or a policy, a sonata or a mechanical computer. Baccalaureate address (9 Jun 1957), Yale University. In In the University Tradition (1957), 156. Every year the inventions of science weave more inextricably the web that binds man to man, group to group, nation to nation. In 'The Free Spirit Confronts the World's Coercion', collected in Living Under Tension: Sermons On Christianity Today (1941), 137. Evolution is a process which favors cooperating rather than disoperating groups and that “fitness” is a function of the group as a whole than of separate individuals. The fitness of the individual is largely derived from his membership on a group. In On Being Human (1950), 45. Thomas S. Kuhn's Foreword to Paul Hoyningen-Huene, Reconstructing Scientific Revolutions: Thomas S Kuhn's Philosophy of Science (1993), xiii. I am compelled to fear that science will be used to promote the power of dominant groups rather than to make men happy. In Icarus, or the Future of Science (1924), 5. I should like to call the number of atom groups, with which an elementary atom coordinates … to form a complex radical, the coordination number of the atom in question … We must differentiate between valence number and coordination number. The valence number indicates the maximum number of monovalent atoms which can be bound directly to the atom in question without the participation of other elementary atoms … Perhaps this concept [of coordination number] is destined to serve as a basis for the theory of the constitution of inorganic compounds, just as valence theory formed the basis for the constitutional theory of carbon compounds. In 'Beitrag zur Konstitution anorganischer Verbindungen', Zeitschrift fur anorganische Chemie, (1893), 3, 267-330. Translated in George G. Kauffman (ed. ), Classics in Coordination Chemistry: Part I: The Selected Papers of Alfred Werner (1968), 84-87. I think all museums should be directed toward 12-year-old boys. They’re the brightest group you can find and this is the age when you can arouse their curiosity and interest. It has been the final aim of Lie from the beginning to make progress in the theory of differential equations; as subsidiary to this may be regarded both his geometrical developments and the theory of continuous groups. In Lectures on Mathematics (1911), 24. Just as the individual is not alone in the group, nor anyone in society alone among the others, so man is not alone in the universe. In Tristes Tropiques (1955, 1974), 414. One has a feeling that one has a kind of home in this timeless community of human beings that strive for truth ... I have always believed that Jesus meant by the Kingdom of God the small group scattered all through time of intellectually and ethically valuable people. Perhaps the least inadequate description of the general scope of modern Pure Mathematics—I will not call it a definition—would be to say that it deals with form, in a very general sense of the term; this would include algebraic form, functional relationship, the relations of order in any ordered set of entities such as numbers, and the analysis of the peculiarities of form of groups of operations. In Presidential Address British Association for the Advancement of Science, Sheffield, Section A, Nature (1 Sep 1910), 84, 287. Psychologism is, I believe, correct only in so far as it insists upon what may be called “methodological individualism” as opposed to “methodological collectivism”; it rightly insists that the “behaviour” and the “actions” of collectives, such as states or social groups, must be reduced to the behaviour and to the actions of human individuals. But the belief that the choice of such an individualist method implies the choice of a psychological method is mistaken. In The Open Society and Its Enemies (1945), Vol. 22, 87. Science began to be powerful when it began to be cumulative, when observers began to preserve detailed records, to organize cooperating groups in order to pool and criticize their experiences. Scientists are human—they're as biased as any other group. But they do have one great advantage in that science is a self-correcting process. In Pamela Weintraub (Ed. ), The OMNI Interviews (1984), 14. Spaceflights can’t be stopped. This isn't the work of any one man or even a group of men. It is a historical process which mankind is carrying out in accordance with the natural laws of human development. As quoted in Space World (1974), 10. The mathematics of the twenty-first century may be very different from our own; perhaps the schoolboy will begin algebra with the theory of substitution groups, as he might now but for inherited habits. The Theory of Groups is a branch of mathematics in which one does something to something and then compares the result with the result obtained from doing the same thing to something else, or something else to the same thing. In J.R. Newman (ed.) The World of Mathematics (1956), Vol. 3, 1534. There are no standards for computer programmers and no group to certify them. From review titled 'Is Science Evil?' about the book The Myth of the Machine: The Pentagon of Power by Lewis Mumford, in New York Review of Books (19 Nov 1970). … on these expanded membranes [butterfly wings] Nature writes, as on a tablet, the story of the modifications of species, so truly do all changes of the organisation register themselves thereon. Moreover, the same colour-patterns of the wings generally show, with great regularity, the degrees of blood-relationship of the species. 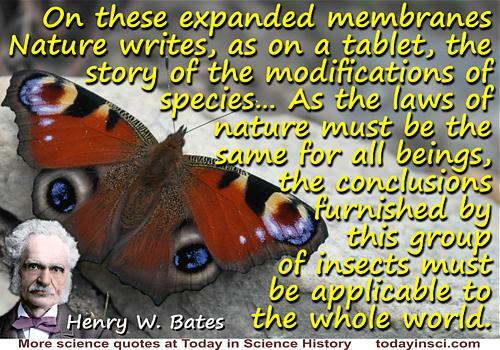 As the laws of nature must be the same for all beings, the conclusions furnished by this group of insects must be applicable to the whole world.